This story was written by Amie Parnes and Ben Smith. Rep. Loretta Sanchez says she's happy for the chance to vote for Hillary Rodham Clinton at the Democratic National Convention, and she predicts that as many as half of the Democrats in the House could join her. Just how many former Clinton supporters will vote for the former First Lady during the symbolic first ballot is anybody's guess, but each of them will be called upon to do so, whether they want to or not. On Friday, the Obama campaign confirmed that the floor vote in Denver, intended to assuage Clinton supporters still stewing over her narrow loss, will be conducted as a state-by-state roll call. Under proposed convention bylaws, delegates would be forced to register their votes on a tally sheet with the convention secretary  the rules could be altered or suspended before the start of the convention. "By putting her name in nomination, you're putting people on the spot," said former delegate counter Matt Seyfang, adding a second potential drawback: "Having a roll call ... just chews into your broadcast time." Lower-key options were available. For example, Clinton's name could have been entered into nomination, followed by laudatory speeches, ending with her release of delegates to Obama and proposal that he be nomination by acclamation, Seyfang said. Obama spokesman Bill Burton said the "mechanics" of the roll call vote are still being worked out, but he conceded that Clinton probably will garner many votes on the first ballot. For Obama's camp, the roll call is a ritual that will defuse any potential tension with Clinton or her supporters without affecting the outcome or the theater of Obama's dramatic nomination. Said Sanchez: "I believe there are a lot of supporters for Hillary among the superdelegates, especially now that they've agreed to place her name in nomination. I think half the House Democrats would probably be Hillary supporters, especially women. ... I felt she was the most experienced and the best candidate and I still feel that way." 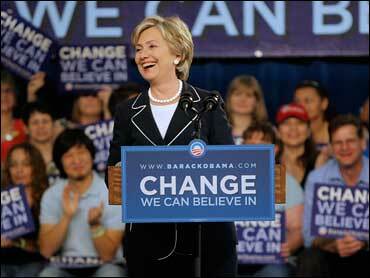 Clinton herself has said she plans to vote for Obama. A longtime Clinton adviser said it was "crazy" to guess at numbers but estimated that the former first lady would garner between 600 and 1,200 delegates - considerably short of the approximately 1,800 she had collected at the time of her departure from the race in early June. "It's a bizarre strategy," said one Democratic strategist of the roll call. "It could backfire and show that her influence is waning. Chances are, she's not going to have as many delegates vote for her on the floor as she had in the primary." Indeed, many Hillary diehards, including at least one member of the New York delegation, are reluctant to vote for Clinton after switching over to Obama. "I think that most superdelegates, including myself, are going for Obama," said New York Rep. Anthony Weiner, who campaigned with Clinton around the country. "I made my decision for Obama, and I'm not switching again." "My boss is totally conflicted about it  and pissed Hillary is putting us in this position," said a congressional staffer for another New York House member. "We still haven't made up our mind and I don't know when we are going to." Another New York delegate, speaking on condition of anonymity, predicted that as many as 30 to 40 percent of the New York delegation would pick Clinton over Obama during the symbolic vote. Obama's decision to accept a roll call vote, which came after weeks of talks with the Clinton camp, doesn't mean he'll let the process get out of hand, observers say. "The convention is about nominating Barack, so his people want to speed hrough the vote as fast as possible so it won't take too much TV time," said a Democratic delegate who plans to vote for Clinton. "They also want to avoid a scenario where she's leading at any point." Additional reporting by Glenn Thrush.